DAD’s AX32 audio router and converter has offered expandability for handling advanced monitoring for years, but now the system reaches a whole new level. 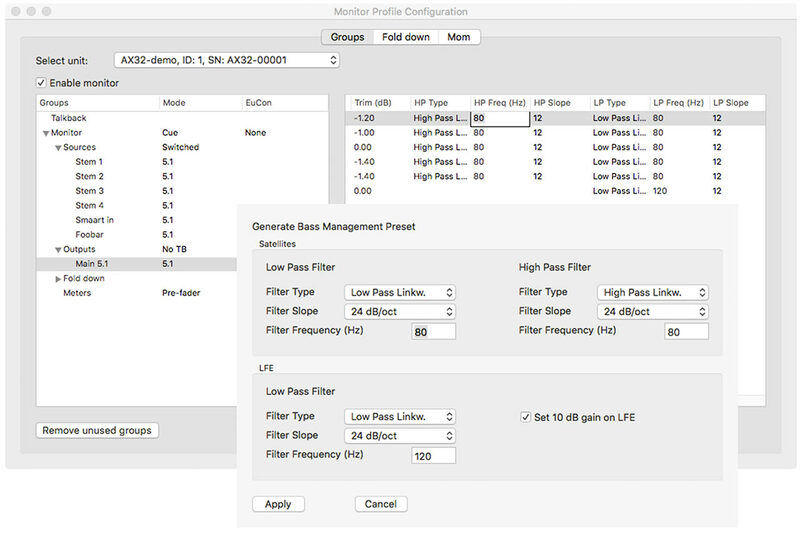 The optional and dedicated monitoring system license, Pro|Mon, now reaches firmware version 2.1, adding support for installing DAD’s brand-new SPQ speaker processing DSP card. The DADman control software is also updated – to version 5.3 – which unlocks support for SPQ control, as well as adding a Sample Rate Converter on MADI inputs and Dante version 4.0 firmware with support for Dante Domain Manager. The SPQ speaker processing card allows you to add up to 1,024 EQ filters across 128 channels at 48 kHz. You can use a maximum of 16 filters on each channel until the 1,024 limit has been reached. But if you work at higher resolutions, the system supports 96 kHz (64 channels), 192 kHz (32 channels) and 384 kHz (16 channels). Filters for all sample rates are available natively on the SPQ card when sample rates are changed. SPQ also adds full control and Bass Management processing over up to 8 sub channels, and both the Bass Management and speaker channels offer a wealth of different filter types to choose from in order to tailor any speaker system to suit any acoustic environment you may have. “AX32 is evolving continuously, and while the physical SPQ card is a new, optional expansion of the system that can be purchased when the need arises, we are also very happy to be able to provide free firmware and software updates that include new features and possibilities to our existing customers,” says Mikael Vest, DAD’s Sales Director. The 2.1 firmware update will also be compatible with the DAD DX32R, Avid MTRX, as well as NTP technology’s Penta 720, and all firmware and software updates are available now along with the SPQ speaker processing card. Reaching version 5.3, the DADman control software adds several new features if you have added the optional Pro|Mon license. Obviously, you now gain access to the wealth of SPQ card filters if the DSP card is installed, as well as extensive, channel-based Bass Management control via a dedicated configuration page. In addition, you also get to control delay on both channel level and globally, and the Global Delay parameter may even be applied to a physical button on the company’s MOM hardware monitor controller (Monitor Operating Module). For added flexibility, you can now create your own custom source and speaker formats in addition to the various presets that are included as default, and there is now a dedicated configuration page for custom immersive audio formats available. Finally, speaker outputs can now be reused for different speaker sets in the control room if preferred. Obviously, this brand-new firmware makes AX32 compatible with the SPQ Speaker Processing expansion card, but that’s not all you get. Even if you don’t plan on installing an SPQ card right now, you can still benefit from updating the firmware of your AX32. First of all, part of this firmware release is also updating the Dante card to version 4.0 in order to give you full access to Dante Domain Manager functionalities, but on top of that, we have also added sample rate conversion to the MADI stream.